Search for tigers and see the Taj Mahal on this enthralling holiday in Northern India. 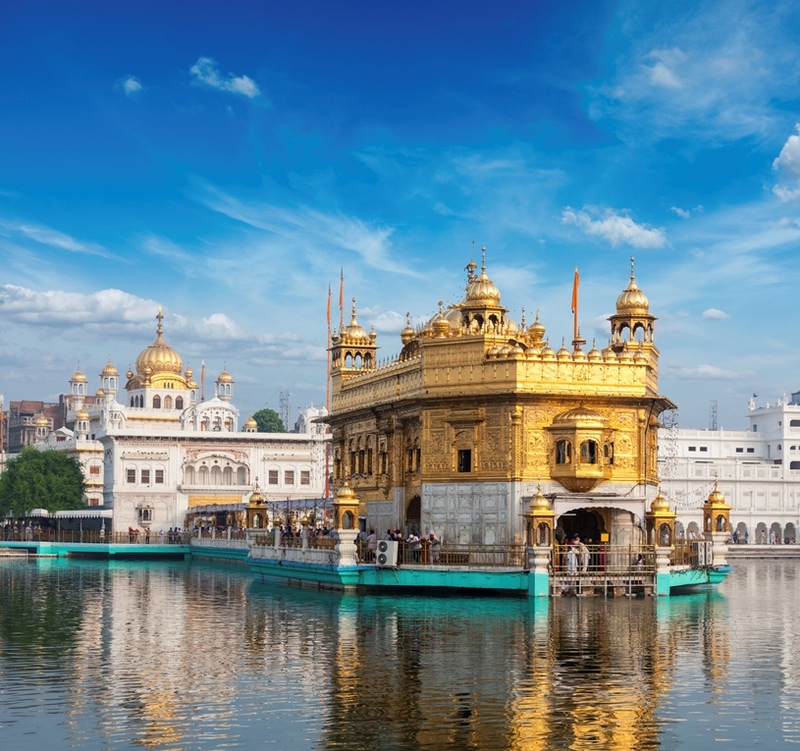 Discover Amritsar’s sacred Golden Temple as you tour the Punjab, and the beautiful Himalayan hill state of Himachal Pradesh. See the border-closing ceremony at Wagah on the Indo-Pakistani border, and take a first-class train ride from Delhi to Jalandhar on the Shatabdi Express. Today’s explorations begin with a guided tour of the Old City, and an exciting rickshaw ride through the lanes of Chandni Chowk. Afterwards, you’ll explore New Delhi, with its echoes of the British Raj, and visit the impressive Agrasen ki Baoli stepwell and the ruins of the ancient Quwwat-ul-Islam mosque. This afternoon, you’ll travel to the ‘Pink City’ of Jaipur, where you will enjoy a two-night stay. Visit Amber’s extraordinary hill-top fort, travelling by jeep to explore the Royal Halls and enjoy magnificent views. This afternoon, see the sights of Jaipur, including the stunning City Palace museum complex, the famous astronomical observatory and the 18th-century ‘Palace of the Winds’. Dinner tonight is with a local Rajasthani family in the city. Beautiful Ranthambhore National Park is one of the best examples of India’s conservation programme Project Tiger, and the destination for your next two-night stay. Rest and relax in the park’s surroundings, or join this afternoon’s optional excursion to take in the views from Ranthambhore Fort. Today’s highlights will be two canter (open-air vehicle) safaris in the company of a knowledgeable naturalist guide. Search for signs of the legendary Tigers of Ranthambhore, as well as some of the park’s other inhabitants: striped hyenas, sambar deer, sloth bears and perhaps even leopards. Lunch is included today. An early morning cruise on the Chambal River offers the opportunity to spot crocodiles, turtles and an assortment of birds. Then, travel to Agra, the ‘City of Love’, whose crowning glory is the awe-inspiring Taj Mahal. Visit majestic Agra Fort before your first sight of the ‘Taj’ – a monument to undying love – viewed in all its glory at sunset. This morning, we’ll board the air-conditioned Shatabdi Express train heading north from Delhi to Jalandhar. You’ll travel in first class, and breakfast will be provided en route. On arrival, enjoy lunch, and then transfer to Pragpur hill station, where you’ll stay for the next two nights. This former Royal settlement was declared India’s first Heritage Village and has become a living museum radiating relaxed charm, history and culture. Highlights include the 19th-century artificial Taal pond – the centre of village life – the colourful temples and the traditional artisans’ shops. Spend a full day out in the foothills of the Himalayas, calling at Dharamsala, where lunch is included. This former British hill station still draws international visitors – as does its upper town, McLeod Ganj, not least because it’s the Dalai Lama’s home-in-exile. On our return, we’ll stop to enjoy exceptional views and a late lunch at hilltop Kangra Fort. Today you’ll take a scenic journey across the Punjabi plain to Amritsar. Freshen up at your hotel before the perfect introduction to this city. At the breathtaking Golden Temple, Sikhism’s holiest shrine, join the throng for the extraordinary Palki ceremony. Visitors are welcome to join the devotees who line the bridge over the sacred lake each evening for the procession of the Granth Sahib, Sikhism’s Holy Book. Today brings another opportunity to visit the Golden Temple. The jewel-encrusted, golden-domed main temple, the vast dining hall – where food is distributed free to some 35,000 people each day – and the Central Sikh Museum are all highlights of a fascinating day. You’ll also visit the poignant Jallianwala Bagh memorial park, which commemorates one of the bloodiest days in Indian history. You will also have the chance to visit the bustling bazaar in the heart of the Old Town. This evening, you’ll make the short journey out to the Indo-Pakistani border crossing at Wagah, where the gates are closed and the flags lowered at sunset in a colourful, unforgettable ceremony. This morning we’ll head to the airport to board your flight home to the UK via Delhi, arriving back in the UK late this afternoon.